Our early Saturday morning ritual was interrupted by a phone call from Mike, our energy audit guy. I thought the furnace and everything to do with it's installation was behind us, but apparently not.His call this morning was to inform us that he'd (or according to him, his kids) lost our paperwork and it would all have to be completed again. The first audit is to tell how energy efficient the house is. The second one is to show how much improved it is after we block all the holes. The red thing is a frame that fits inside the door frame and it blocks all the air, while the fan, that yellow thing at the bottom blows the air out and a pipe that you can't see in the picture, runs into the meter that Mike is reading. With furnace service people in and out 8 times since the installation of the furnace we didn't have a lot of time for picking up materials and doing work. What we did do for the second audit was to leave the blinds and curtains closed the way they normally are in the winter and Mike was surprised at the readings he was getting. Without the paperwork, we don't get the government grant which is potentially 50% of the cost of the new furnace. So this morning he had to come over and get the copies of the reports that we have and duplicate the forms he needs to send in. Nice guy Mike, but from now on tell your kids Daddy's office is off limits. 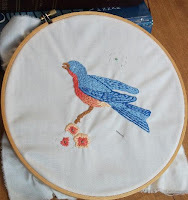 I managed to re-do the bird I already showed you, with a darker blue outline thread. It made a world of difference. I like this version much better. The long and short stitch does allow for nice colour blending, doesn't it? I don`t like the flowers. I started with a light centre and darker outer area, but I though it was too vivid and switched it, but the pale outer shade is kind of merging into the cream coloured background and disappearing. They either need to be changed totally or I need to take a very dark burnt orange in a single strand and outline the flowers to make them stand out. I think that's the way I'll go since it's less work and I'm already tired of working on it. and I know that a big chunk of the tatting community is comprised of seniors that just don`t have that kind of money. On the other hand my knowledge and teaching ability are worth something. When I started, I thought I knew a little bit that I could share, but as I got into I realized that I actually know quite a bit. It`s amazing when you sit down to write things out and explain them, that you realize that you have accumulated a lot of worthwhile information. So, I think the $20 cost is reasonable. I really struggled with the patterns for my first book Transitions in Tatting as many of the designs were 3D flowers. How do you draw in 2 dimensions, a pattern for a piece of lace that is in 3 dimensions? Almost every pattern had to be drawn and re-drawn and re-re-drawn until I was reasonably certain that the average person would understand them. I do tech support for my husbands software and I'm accustomed to thinking in terms of how to explain things simply so that the average inexperienced person will understand and not confuse things. I am usually quick on the pick up of anything I attempt and for years I had done crochet work. Every time you get to the end of a row, you reverse work and turn it left to right. Then I started tatting and tried turning it left to right when it said reverse work, but as soon as I did the pattern made no sense. It took a phone call to an experienced tatter to help me understand what I was doing wrong and show me that RW meant turn it top to bottom and not left to right. Such a simple thing, but to me it was a complete blank wall. Remembering that blank wall helps me to think outside the box when I'm explaining things, to see how other people might be misunderstanding what I'm saying. After all, if I say "dog" and think big and black, but you think small and white, we're not really talking about the same thing, are we? Just signed up for your class and am so looking forward to it. Thanks for the opportunity. I'm looking forward to it too. There's nothing like working with a bunch of newly motivated people to get your own creative juices flowing.